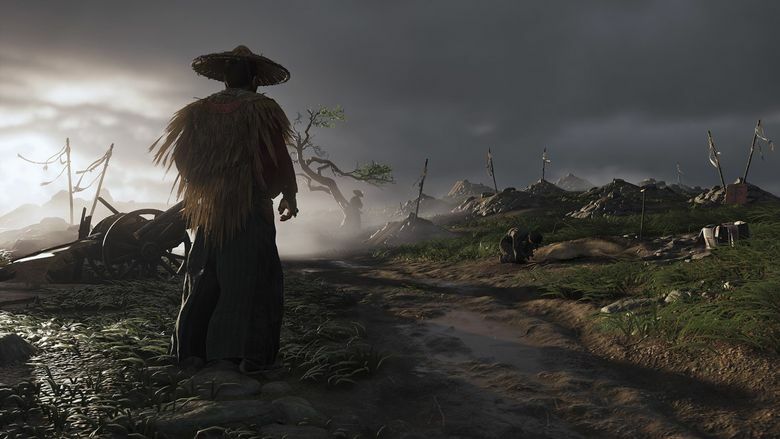 The stunning 8-minute trailer for “Ghost of Tsushima,” from Bellevue-based gaming studio Sucker Punch, drew huge cheers from a packed audience at Sony’s briefing in the video-game trade show E3. An early peek at one of Playstation’s most anticipated games shows a samurai riding his horse down a slight slope across a lush, green, quiet landscape. But that peacefulness is quickly interrupted when Mongol warriors attack, forcing the samurai into battle. The stunning 8-minute trailer drew huge cheers from a packed audience Monday at Sony’s briefing at the video-game trade show E3. Bellevue gaming studio Sucker Punch has been working on the game, “Ghost of Tsushima” for nearly four years, and its story stretches long before that. Chris Zimmerman, co-founder of the Sony-owned game studio, was “vibrating with excitement” Tuesday when showing off the game, which does not yet have a release date. The last few games from the studio, such as “Infamous Second Son,” have taken place in the familiar Seattle, but “Ghost” transports players far away. The game takes place on the small island of Tsushima in Japan, the first place Mongols attacked in 1274 during the invasion of the country. In the open-world game, samurai Jin has to learn new skills and approaches to fight back when his usual tactics aren’t working. “He has to go beyond what he knows,” Zimmerman said. That’s the idea behind the title of the game – Jin becomes a “ghost” that eludes the Mongols on the island. The 125-person Sucker Punch studio has sent several teams of employees to Tsushima on scouting trips, making sure to capture the right feel for the game. It’s influenced by filmmaker Akira Kurosawa, Zimmerman said, and features the sweeping artwork Sony games are noted for. Sony took a game-focused approach to its E3 press conference this year, showing long trailers of several games in a series of locations, including a theater built to look like a church in the game “The Last of Us,” a Japanese garden scattered with red leaves and a large domelike amphitheater. Zimmerman has long wanted to make a game based in Japan, a country noted for its video-game roots and rich history to draw storylines from. When Zimmerman and his colleague came up for the idea after brainstorming different ages in Japan’s history they paused for a moment. “It was weird because, why hasn’t anyone already made this game,” Zimmerman said they wondered. Sucker Punch was formed more than 20 years ago in Bellevue, and has worked with Sony for almost that whole time. Sony bought the studio in 2011. The game has an option to play in either English or Japanese, and Zimmerman thinks many people will opt for Japanese to keep the old-world atmosphere alive. Nearly all the actors the studio used in the game are Japanese, but even they needed dialect coaching to get the ancient sound of the language just right, Zimmerman said. “Ghost” does not yet have a release date for the Playstation, and the studio is staying pretty quiet about the various combat tactics that will be used in the game, as well as the exact storyline. Zimmerman did say that not only will Jin fight Mongols, he will also become more connected to the people of the island, which he has been somewhat separate from as part of the aristocratic class.